The year 2018 will be burned into our memories forever as our endless summer in Germany. 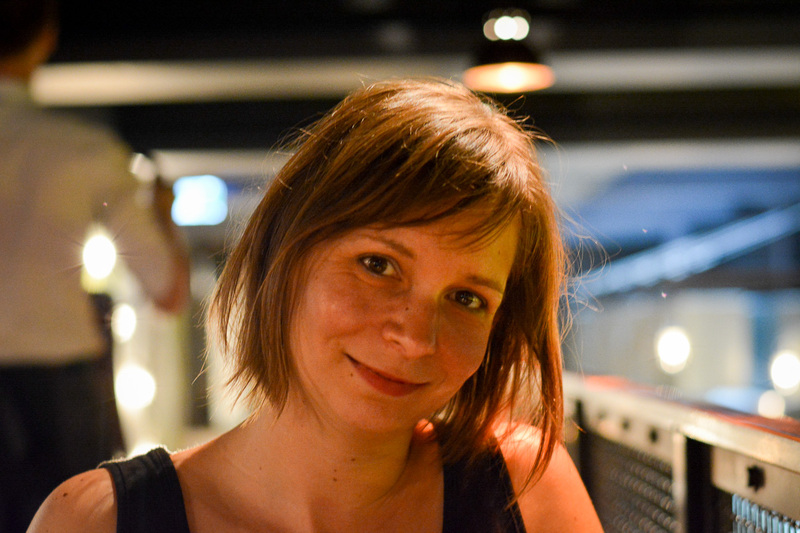 It’s been three weeks since we moved back to Berlin after a fourteen year hiatus. And since our first day back the country has presented itself from its hottest side. As it seems, no day has been cooler than the mid-20’s, some days easily reaching 40 degrees. No rain, no clouds, just hot sticky nights and furnace breezes during the day. We soon realised we had to work out an escape plan to make the heat more bearable. 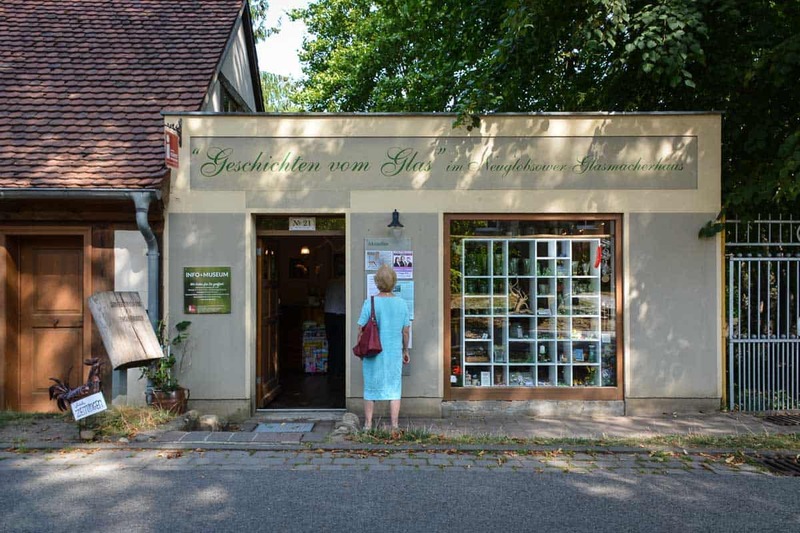 Leave behind Berlin for the day to find respite in the cool countryside of north Brandenburg. Let me introduce you to “Operation Lake Stechlin”. Lake Stechlin has been no stranger to us. Fourteen years ago, before we had left Germany for Australia, before we had children, when life was still simple, we had loved our trips from Berlin to the lake. You see, spending a day by the lake is a popular summer pastime of Berliners. There are plenty of waterholes and natural swimming pools to choose from in the city and surrounds. But, I daresay, none has been as captivating as Lake Stechlin. Its waters are so clear and clean, you can walk straight in and not be bothered by slimy algae and spiky water plants. You will see every stone on the floor until you are at a depth that would allow you to swim. The water smells sweet and fresh and not fishy at all. In fact, the lake is so clean, you could potentially drink straight from the water. Lake Stechlin is embedded in a pristine landscape. It is part of Naturpark Stechlin-Ruppiner Land, a wider nature protection area. Deep forests of beech trees dominate the scene; the lakes are some of the cleanest in all of Germany. The closest town to Lake Stechlin, Neuglobsow, is not much more than a small village. Separated by woods from the shores of the lake, it is a secluded community in the middle of the forest. A cul-de-sac with no passing traffic, no shops, and just a mild form of tourism. 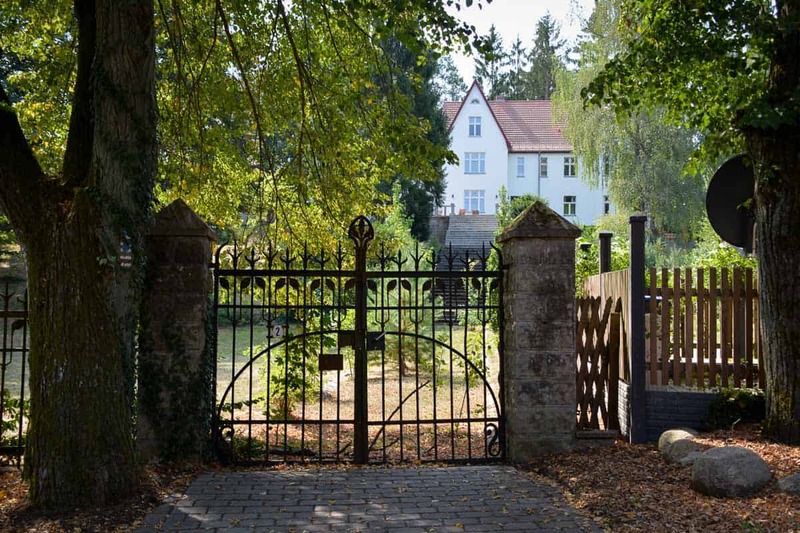 Neuglobsow is located on the end of the road that leads deep into the beech forest. It is a traditional glassmaking village with mild tourism. All around the lake, the dark beeach woods close in on the shores. There is no house in sight. Curiously, we know that there is a disused powerplant just behind the treeline on the far end of the lake, hidden from view, but it is in the process of careful demolition. Besides the small beach area, humans are refreshingly absent. The woods mute the delighted screams of children that echo across the lake. However, there are fishes everywhere, swarming around in the shallows. Ducks and swans, birds of prey flying low on the lookout for fish. Colourful dragonflies dance on the surface, resting here and there. When day tripping to Lake Stechlin, the drive is part of the journey. 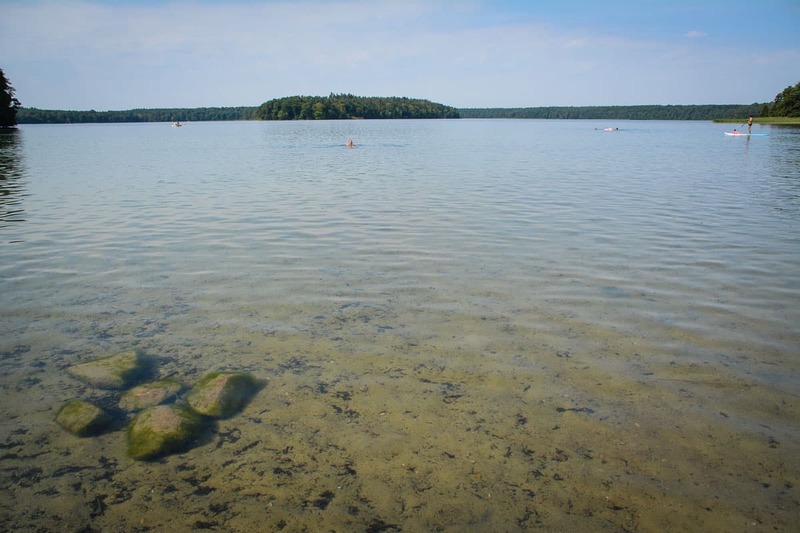 Brandenburg is a lovely country with pretty lakes, deep forests and historic villages. The appeal of Lake Stechlin is not just its natural beauty. The lake is part of a bigger journey that will take you to an unique landscape of villages and fields and woods. Every time we go there, our arrival at Stechlinsee is just the pinnacle of a day trip from Berlin, the orgasmic culmination in a city escape trip back to nature. You see, there is no quick and easy way to get here. Visiting Lake Stechlin requires a degree of determination and a willingness to commit. It is not just a destination but part of a journey. 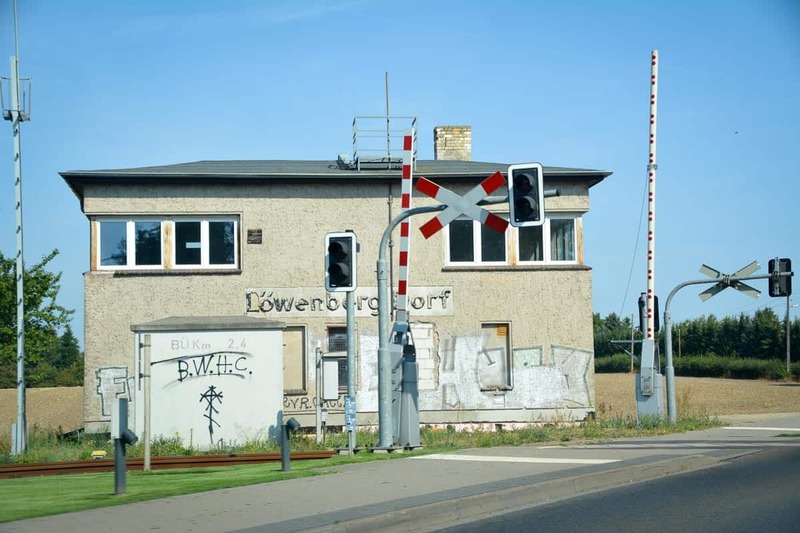 You will leave the autobahn early on and pass through several villages that seem to get smaller the farther you go. Historic places with a rustic charm, crumbling barns with broken windows, bricked up doors in the shade of ancient chestnut trees. Grey train station buildings with faded lettering, graffiti on the lower floor. 19th-century houses with stukko above the entrace, front steps long gone. This summer, we travel through a landscape of relentless summer heat. Brandenburg has turned into a country of golden fields of maize and corn, struggling in the blistering heat. Harvest machines sending up thick clouds of dust in the shimmering air. 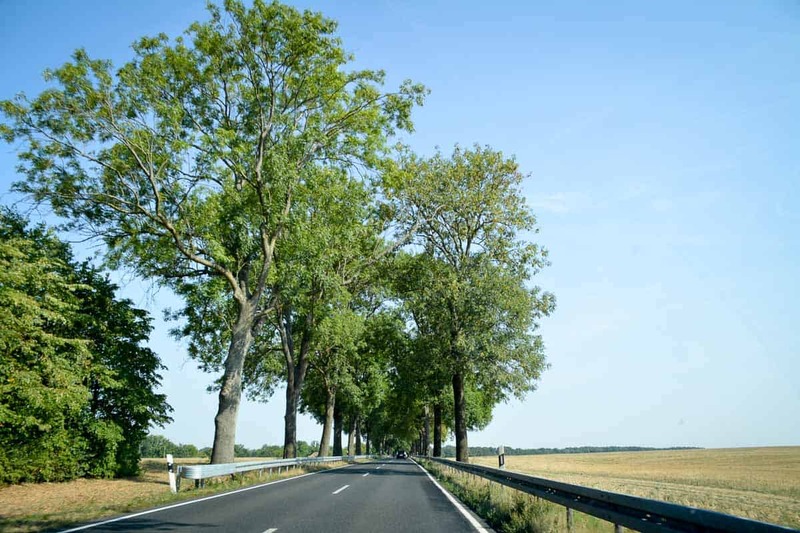 Winding country roads lined with trees that cast a playful pattern of light and shade onto the hot asphalt. Cows and horses, huddling together in the cooler spots of their bone dry pastures. We love this endless summer feeling, thrive on the views of a landscape that seems to sigh under the oppressive rays of the sun. German landscape after a long hot summer: the hay is rolled up to giant wheels, the harvest is putting up one last fight against the drought. Driving the car down these country roads, we have brought our trips to Lake Stechlin to perfection. Over the weeks, our trip becomes a well practiced dance routine. We know to leave Berlin early and go with the flow as soon as we hit the B96. Passing through a string of villages, we stop at the local food stalls to buy smoked fish and fresh berries. Each time we drive past, we admire the pretty village church in Metz and the historic city gate in Gransee. When we get onto the last stretch of our road trip, we secretly beam with joy as we are swallowed by the dense forests that surround the remote village of Neuglobsow. Even before we first visited, Lake Stechlin was no stranger to us thanks to a literary connection. One of the areas most famous poets, Theodore Fontane, wrote his last novel based on a fictional location near Lake Stechlin. As you enter Neuglobsow village, the gateway to the lake, you are fooled to think you may have found this fictional place. Surrounded by old humble timber frame cottages, now mostly used as holiday apartments and restaurants, there is a stately villa on the only hill of the village. A small castle, really, with a generous porch and steps leading to the front garden. A failing metal fence, stone posts surrounding the property. This is Haus Bernadotte, a summer residence with lose ties to the Swedish throne. It’s in private hands and cannot be visited, without doubt it is one of the most beautiful houses in the village. The Glass Museum in Neuglobsow shares some insights in the story of glass making in the area. 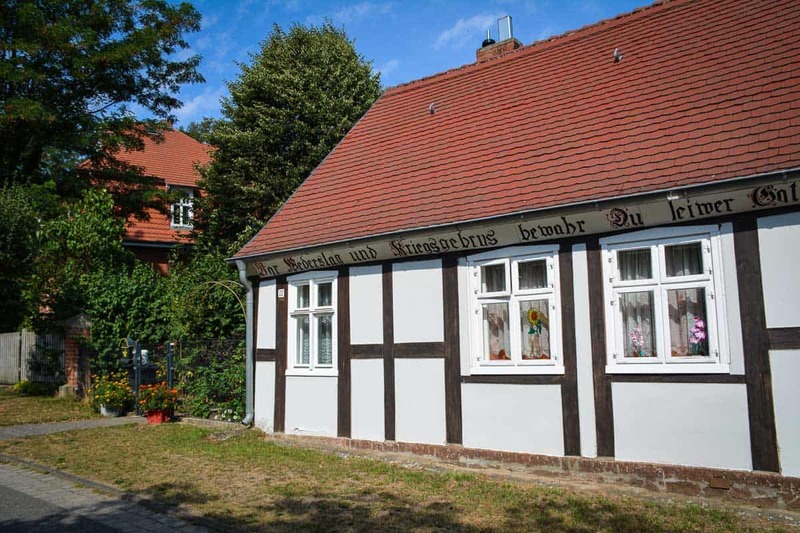 Neuglobsow was founded by glass makers, and there is a small museum which you can visit to learn more about the history of glassmaking in the area. With so many day trippers visiting the town from near and far each summer, it is hard to believe that Neuglobsow was once a lost and forgotten village in the woods, so remote and peaceful like a sleeping Beauty. On rare occasions, we found that the weather differed here dramatically from what we would experience in Berlin, making the lake unusable for the day despite the long trip. 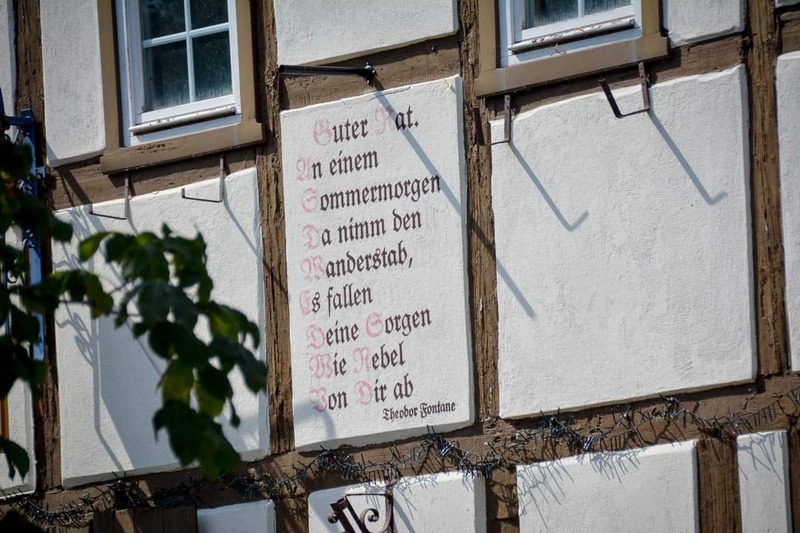 Luckily, Neuglobsow always has something new to discover, so that the trip was not in vain, including some nice German restaurants with rustic traditional kitchen. 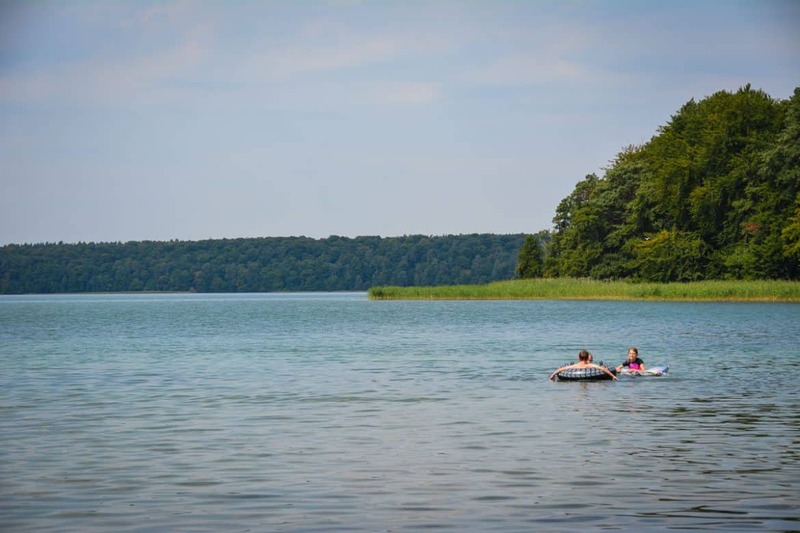 If you are looking for a dreamy and relaxed day trip destination from Berlin, Lake Stechlin might be just what you are after. Don’t be put off by the distance and the length of travel (1.5 hours) – it is indeed the journey that is part of the experience. 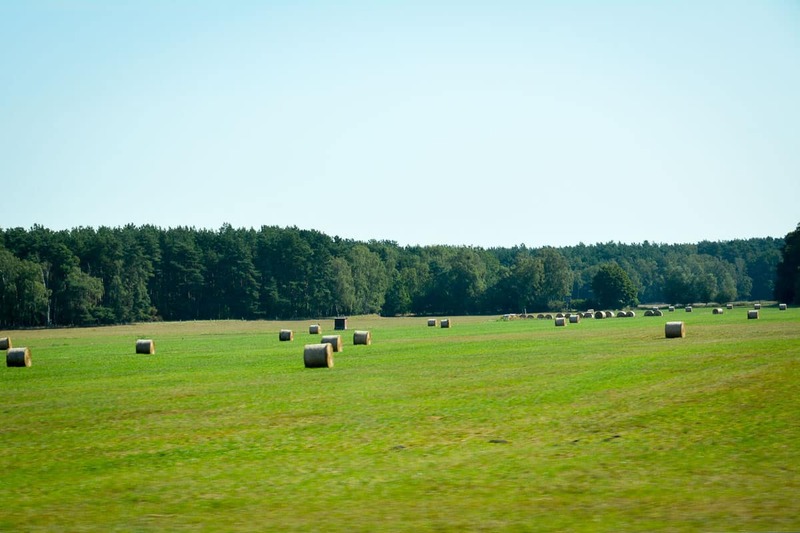 Since there are no direct motorway connections, you will be forced to slow down and immerse yourself in the countryside. Make sure you stop for fresh produce and snacks along the way to stock up your picnic supplies. Neuglobsow has introduced a parking scheme for visitors a few years ago. You will need to park in the designated areas, with the parking closest to Lake Stechlin requiring the payment of a small daily fee. Come early as you may risk not finding a space to park here. If you are travelling with kids and lots of luggage, think about investing in a folding push cart for your belongings like this cool one found on Amazon (affiliate link). Even from this closest parking lot you will still have to walk some minutes to reach the shores of the lake. A short walk through the beech woods separates Neuglobsow from Lake Stechlin. Travel light or buy a cart to take your picnic and belongings with you to the shore. 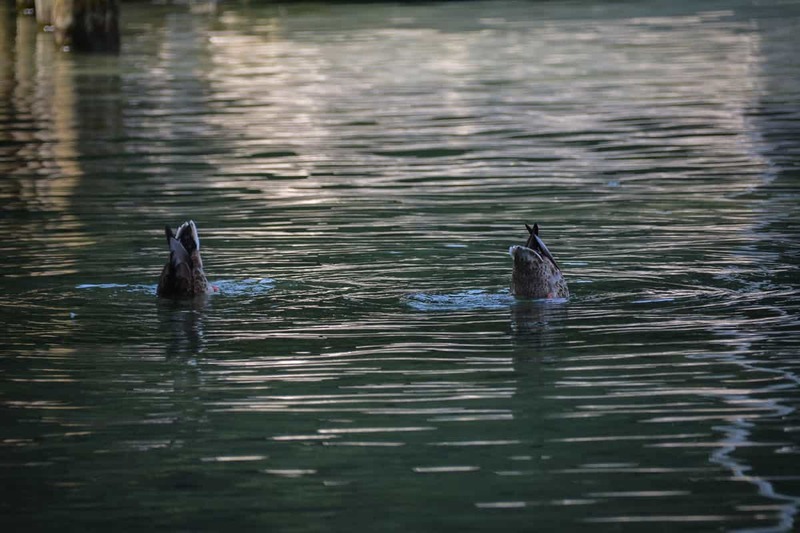 Bathing is free at Lake Stechlin. 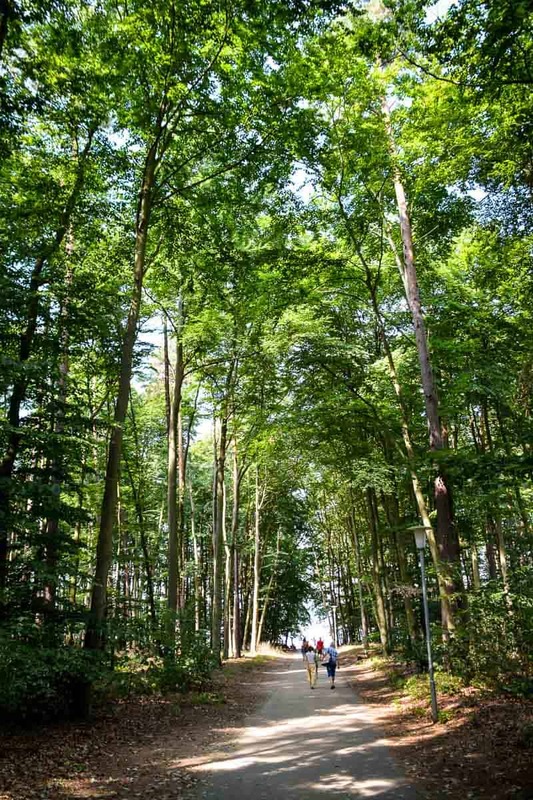 Trees nearby provide ample shade and there are a couple of services in summer to make your life easier: a small playground, a beach volleyball court, SUP and boat hire, a snack and ice cream bar, strandkorb rental. More info on Stechlin can be found in German on the official website. For more questions, feel free to ask! Check Out my Other Berlin Posts!